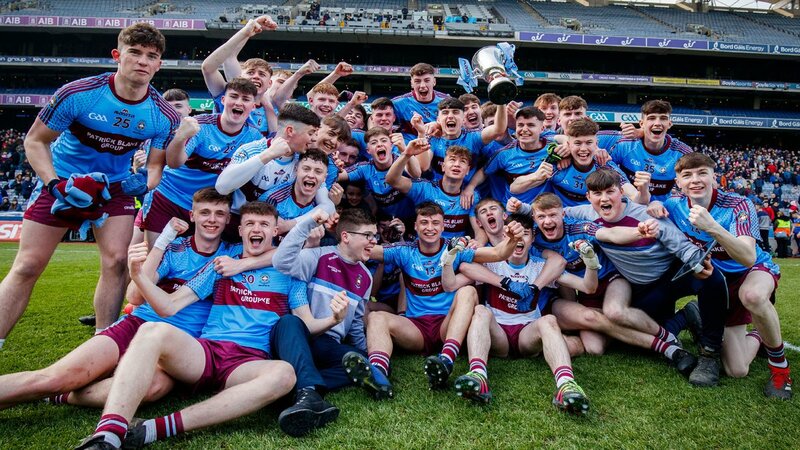 St Michael’s Enniskillen secured a first ever Hogan Cup with a one point victory over Naas CBS in a thrilling encounter in Croke Park on Saturday. In a tense finish to the game, St Michael’s saw a four point advantage with seven minutes to go trimmed back to the minimum but after seven minutes of additional time it was the Fermanagh school who deservedly held on for the victory. The contest was slow to get going with St Michael’s missing a couple of early chances to get scores on the board before Naas opened their account through the dangerous Eoin Conneff. St Michael’s answered soon after as Micheál Glynn landed the first of his seven points from a free. The sides traded points again with Josh Largo Elis registering for St Michael’s before Mikey McGovern replied for Naas but it was the Kildare outfit who were to land the first significant blow of the encounter. A loose kick out by St Michael’s goalkeeper Sean McNally was latched on to by Conneff who raced in and fired to the net. St Michael’s though responded superbly to the set back as Glynn slotted over a free before they took the lead through a Darragh McBrien goal. Captain Brandon Horan produced a brilliant catch from the kick out and sent McBrien through with the forward showing great composure to tuck his shot into the corner of the net. A Tony O’Connor point for Naas drew the sides level once more although St Michael’s then went close to second goal but the lively Conor Love saw his effort hit the side-netting. The Fermanagh side enjoyed the better of the exchanges in the latter stages of the first half as Pól McKervey clipped over a wonderful point from the left before Glynn converted a long range free to put two between them. A McGovern free for Naas did cut the deficit to one but it was St Michael’s who had the last say of the half as Glynn tagged on another point from a free to leave it 1-06 to 1-04 at the interval. St Michael’s made a bright start to the second half as Glynn rattled over the opening two points of the half. He made it a three point game after getting on the end of a great ball from Horan before he made it 1-08 to 1-04 when he finished off following good play from Luke Flanagan and Love. Love then powered his way through the Naas defence but his shot was wide of the post before Conneff hit the Kildare side’s first score of the half. St Michael’s though were on top at this stage and McBrien restored their four point advantage with a good point from play. McGovern brought the gap back to three but as the game entered the final quarter St Michael’s held a three point lead, 1-09 to 1-06. The impressive Paddy McDermott raided forward to leave two between them but St Michael’s remained in control as Glynn arrowed over a free following a foul on McBrien and Love then added on a point. There was though a nervy conclusion to the contest as Eoin Archibold replied with a point for Naas before St Michael’s goalkeeper McNally pulled off a fine stop to deny O’Connor. The Leinster side threw caution to the wind in the latter stages and points from O’Connor and McDermott left one in it. However, St Michael’s did break forward deep in injury time with Flanagan setting up Love for a terrific point to give them a two point cushion. Back came Naas and McGovern cut the gap to minimum while a last gasp point effort drifted wide as St Michael’s saw it out to secure the title.